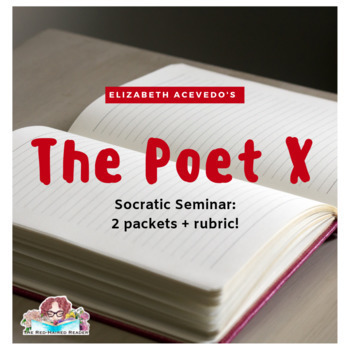 Growing Bundle of 17 Socratic Seminar Packets! This file contains 2 different packets of Socratic Circle questions- packet A and packet B. Each packet contains 3 different questions that require students to answer and provide two quotes from the text to back up their answers. Students are also required to come up with 3 additional questions they will ask if there's time in their circle. Finally, the packet has a page where each student will monitor a partner in the opposite circle. They will make a check each time their partner speaks, and paraphrase a meaningful comment their partner made. Lastly, the file contains the Socratic Seminar rubric. When you print out the file, you'll see packet A on the top half of the sheet, packet B on the bottom half, and then the rubric as the last page of the file. You'll need to cut each packet page in half after you print them out, as each booklet you give to the students is only half a page. They are labeled A and B. Give half your class A, half B, and allow them to plan! The day of the circle, you'll let A discuss for maybe 20-30 minutes, then flip-flop your circles and have B discuss. Please help my little business grow! Did you know that you can receive $ credit towards future TpT purchases by reviewing this product? Please leave a review at the product page or through "My Purchases" under "My Account" at TpT. Thank you!